A Full Day of Show - Tell - Sell for Businesses PLUS Speaker Sessions. There will be four Speaker Sessions on the main stage - great info shared for your business to benefit PLUS each speaker provides a BONUS OFFER to you, over $600 in value. See flyer below. Ladies in Biz - come and join us for our hugely successful TINAx Talks - 8 x 8 minute presentations PACKED with skills learning and inspiration. Over 600 women in business are expected to attend the Expo. Flyer will be sent shortly. Grab a FREE relaxing Massage or get your Brows Waxed for FREE at the Beauty Hub. Plenty of PRIZES to WIN from exhibitors. 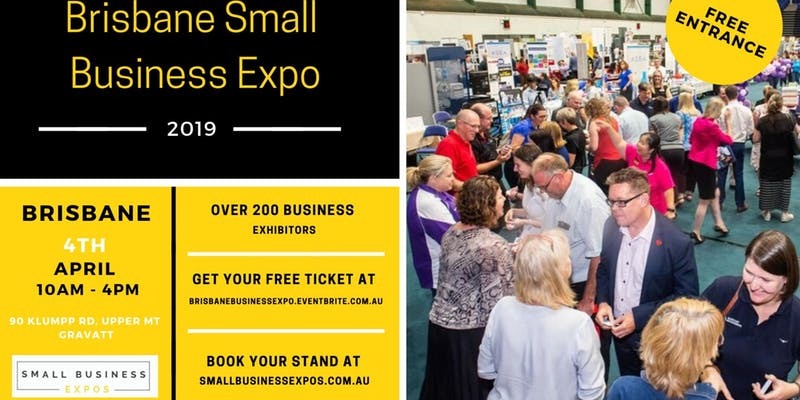 Speak to the Office of Small Business team to see how they can assist you and your business and also catch up with the Brisbane City Council team and check out how they can help you as well. Grab a delicious bite to eat or a coffee and listen to our entertainer Jodie Joy in the Food Truck Eating Area. So do not forget your business cards. This is a business focused full on day. The exhibitors are keen to talk to you, so say hello and have a conversation - they will not bite. To get the most out of the expo - plan to stay for 3 hours - and try to have conversations with as many people as possible for around 5 minutes each, so you can build solid connections. Attendees can bring business cards - but do not bring flyers (you can still book a stand to Show-Tell-Sell). Remember conversations are Two Way - so listen to people and what they have to say. Be clear in your elevator pitch to describe your own business - there are over 1000 business owners going and that is a lot of conversations that you could have - so be clear and concise – save your energy. Have a goal in mind - if you need to target specific businesses - then focus on finding them first. Bring money for lunch and to purchase items or a credit card - we do not have ATM facilities at the Expo. Bring your SMILE - our expos work so well because people have FUN whilst doing business. Join in the FREE activities to get the most out of the Expo - just say YES and jump on in. We are so excited you can join us. Remember : ENTRY IS BY A GOLD COIN DONATION bring a gold coin donation for the charities and assist us with the set up and traffic management of the Expo. Dont scrimp - you get into the expo for FREE so raid the piggy bank if you have to get a few coins together.’We appreciate all of our volunteers and charities that assist us to put this expo on for you. Please do not ALL try to turn up at 10am when the Expo opens. Consider arriving throughout the day, keeping in mind the average time spent at our Expos is 3 hours - even to get around the 230 businesses showcasing and having a chat will take you a few hours to complete. We have a Park and Ride FREE service from the Mt Gravatt Showgrounds to the Expo venue just around the corner. We have the parking area staffed and signed to ensure you have a happy trip. BUS - There is a bus stop right outside the venue and Bus 120 comes direct from the Garden City Shopping Centre which is only a 15 minute trip from the venue. Parking for three hours at the Shopping Centre is FREE. UBER - Park at Garden City Shopping Centre - FREE for the first 3 hours and catch an UBER from there - it is only 5 minutes around the corner. The travel is a business expense. Park in the side streets and walk to the venue - a little walking never hurt anyone - wear comfortable shoes. We ask you to also co-share a car to reduce the number of cars onsite. You would be doing the environment a favour. If you are lucky to get a park in the designated parking area - we will ask you for a gold coin donation - all monies raised go to our charities who assist us on the day. NO STILLETO OR HEELED SHOES - leave your heeled shoes at home - this venue is not a purpose built exhibition centre it is 4 basketball courts and the organisers dont wish to resurface the entire floor because of stilleto marks - just wear comfortable shoes for this one event - we know you can do it. There is coffee and drinks on site at the cafe inside and we also food trucks and live music from 11am to 2pm out the back - you can access this area by the double doors that will be signed FOOD TRUCKS & LIVE MUSIC. Take some time out to sit back and relax and grab a bit to eat in between your sales conversations. We do not have an ATM on site, please bring cash or eftpos to purchase any goods and services and lunch.